Drivers can order stickers with the text “I do not block the crossroad” and stick them on their own car. Smoother traffic in cities, by encouraging drivers not to block the crossroads. Irritated gestures, swear words and lost time are parts of the daily lives of drivers in crowded cities. A lot of the stress in traffic is caused by produced blockages and by drivers without common sense, which are entering in the crossroads even if they know they can not cross it. Also, drivers who respect current traffic laws and choose to not hurry at the traffic light even if it is green, are insistent honking by drivers from behind. One of the strategies of civilizing the drivers is represented by the fines. According to art. 57 point 3 from Traffic Code, a vehicle which is entering on an intersection is prohibited if this occurs blocking the crossroad. According to art. 101 of Traffic Code, is a contravention and is punishable by a fine set out in the third class of sanctions, failure to allow intersection leaving of the driver remained inside it. Another strategy is to educate by example of good practice. 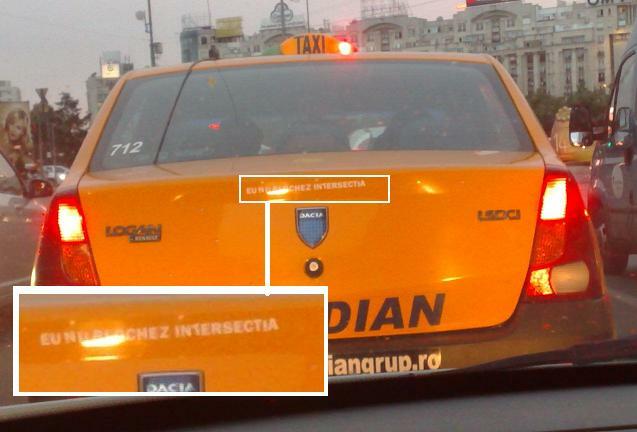 In 2008, the Urban Development Association the campaign “I do not block the crossroad”, a civic campaign for a smooth traffic, which encouraging the drivers to praise themselfs that they don not block the crossroads by sticking a sticker on their cars with the above message. In the first two years of the campaign, the stickers were offered for free by our partneres across the country, and now its can be orderd for a fee on the project website.